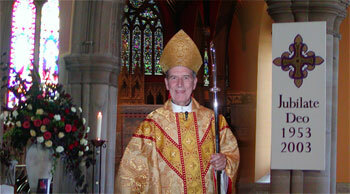 Bishop Hugh Lindsay, Bishop Emeritus of Hexham and Newcastle, died on 19 January 2009. Requiescat in pace. 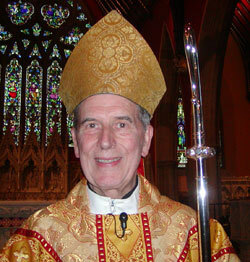 Bishop Lindsay was Bishop of Hexham and Newcastle from 1974 to 1992. Hugh Lindsay was born in Newcastle upon Tyne on 20 June 1927. His primary schools were St. Charles’, Gosforth (1932) and (1936) St. Andrew’s, Newcastle. At St. Cuthbert’s Grammar School from 1938 until 1943, he was with a non-Catholic family in Cockermouth when the school was evacuated there from 1939 until 1941. He was accepted as a Church student at Ushaw in 1943. Under war-time regulations he was conscripted for military service and served in the RAF, mainly in India, from September 1945 until January 1948 when he returned to his studies at Ushaw. Ordained priest by Bishop McCormack at St. Mary’s Cathedral on 19 July 1953, he was appointed to St. Lawrence’s, Byker, and to work at Bishop’s House, which continued when he was sent to Ponteland in 1954. Bishop Cunningham appointed him Diocesan secretary, resident at Bishop’s House from 7 March 1959. Pope Paul VI appointed him auxiliary bishop to the ailing Bishop Cunningham, and he was ordained bishop in St. Mary’s Cathedral on 11 December 1969. After Bishop Cunningham’s death in July 1974, the Chapter elected him Vicar Capitular; then Pope Paul VI named him Bishop of Hexham and Newcastle on 12 December 1974. Ill-health made him resign; he was succeeded by Bishop Ambrose Griffiths on 20 March 1992. He became chaplain to the Augustinian Sisters at Grange-over-Sands where he died on 19 January 2009. 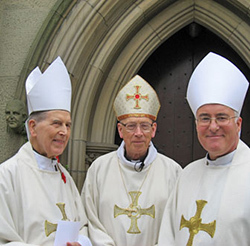 On 2 February 2009, the Feast of Candlemas, the Funeral Mass for Bishop Hugh Lindsay was celebrated in St. Mary's Cathedral by Bishop Ambrose, many priests and a number of bishops from other Dioceses. Extreme weather in many parts of the country prevented several other Bishops, including Cardinal Cormac Murphy-O'Connor, from travelling to Newcastle for this Requiem Mass. Ecumenical and Interfaith representatives and civic leaders were welcomed to the St. Mary's Cathedral for the celebration. The Funeral Mass was followed by Burial in the Cathedral Crypt.